TMGV Series Cam Roller Guides | Harsh Enviroment Ready! 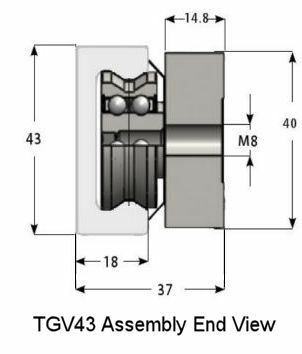 TMGV Series Cam Roller Guides (replacement for the MR Series) are the most robust linear guides. The convex raceways shed dirt and debris that would otherwise inhibit the linear movement of the slider assembly. The cold drawn rails are made of carbon steel that is hardened via nitriding process. They are then post processed in a special way (i.e., proprietary NOX process) to create a very hard and durable, corrosion resistant linear rail that is black in color. Email or call us to discuss your application or click on links below to see more! MR series catalog data is being used until the TMGV43 catalogs are made available. Each series of models are contained in a single ZIP file for convenient downloading. All models are in STEP format. MR series CAD models are being used until the TMGV43 models are made available. From the customer end, Fit and Function are the same. Below is a list of the slider assemblies. Below is a listing of the linear rail available for each slider assembly. It is important to note that the slider assemblies only fit with the same series size rail. Use box above column to filter the table below. Clicking on the part number will immediately take you to our online store.